The keywords are "insurance corporation" but the question is, is it "Federal Deposit" or "Federal Despoti?" And please note that securities are not deposits and like mutual funds are not insured. Something like "Barrett Law," an independent department which exists within the City of Fort Wayne, Indiana Department of Finance, both the Farm Credit Administration (FCA) and the FDIC are an independent branches of the government run by people appointed by the President. Beginning in 1934, the FDIC was a smashing success at liquidating highly marketable farm land which once belonged to struggling families who, thanks to usurers and funneling usurpers, couldn't keep up with their Federal Farm Loans of 1916. By 1976, the FDIC liquidation division constituted the largest real estate investment trust in the U.S. and the corporation overall was the 49th largest U.S. conglomerate. Presumably the fund is financed by a penny ante from bankers on each deposited dollar and does not receive congressional requisitions, though from time to time bankers have come forward with statements like "taxpayers should bear the burden." In 1988 Pres. G.H. Bush proposed at least $90 billion be borne by taxpayers for savings and loan bail outs and FDIC replenishment, and he was endorsed by the Senate Banking Committee. It is unclear who actually regulates the aspect of the FDIC which consistently comes up with billions in bail out packages that actually allow bad bankers and directors to be forgiven while their grantees end up with loads of valuable property for half its value or even for nothing. Of the states through which blazes the trail of Kryder's Money, the FDIC is found not incorporated in: California, Colorado, Michigan, Ohio, or Washington, but is incorporated in Georgia, Florida, Indiana, Missouri, Oklahoma, Pennsylvania (no date available), and Wyoming. While this may have no significance at all, the 1942 incorporation of the FDIC in Indiana has a particularly striking connection to the Estate of Frank H. Kryder. 1861 First transcontinental telegraph completed. The "CENTRAL route" of the Pony Express became the path of the first transcontinental railroad. Ben Holladay acquired the Central Overland California line. When he disposed of his holdings the successor was Wells, Fargo & Company. 1862 Chartered by Congress in 1862 to build part of the first trans-continental railway, the Union Pacific Railroad was given thousands of acres of public lands, generous loan grants along with the rights to borrow private capital. 1872 Influential stockholders of Union Pacific RR organized the construction company Crédit Mobilier of America, and under Oakes Ames, a U.S. Representative, made contracts with themselves which depleted the congressional grants and left the railway heavily in debt. 1890 The Lincoln National Bank, Washington, DC was chartered March 1890- correspondents were National City Bank, Continental National Bank Chicago, Bank of New York and Trust Co.
1893 The Union Pacific RR went into receivership; financial panic caused a depression. 1899 Argentine Home Bank est. 1899. 2/23/1899 American Central Life Insurance Indianapolis incorporated. 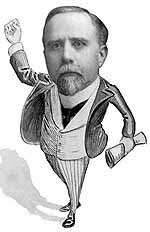 6/26/1901 Failure of the New York brokerage firm Henry Marquand & Co.
6/28/1901 Seventh National Bank of New York was closed. 7/30/1903 The Doylestown National Bank, one of oldest in Pennsylvania was closed by the State Comptroller. 7/18/1907 People's National Bank, Gallatin, TN was closed by the state examiner. 04/01/1909 Beginnning of Continental National Bank, Lincoln, Nebraska, as The German American State Bank. 1912 1/04/1912 The American State Bank, Terre Haute, IN was closed by the state banking commission- shortages were found in president W.H. Taber's accounts. 1914 First State Savings Bank of Superior (Nebraska) failed. 1921 2/17/1921 Directors closed People's State Bank Grand Forks, ND following a "run." 4/18/1921 An offering of $40,000,000 in Farm Loan Bonds was made. 12/09/1922 Clarence and Minnie V. Kryder purchased Lots 1-60 W.H. Simons Addition, re-platted as Kryder's Addition for $12,000.00 gold coin in hand. 1923 Articles of Incorporation, The Standard Building Company, Inc.
10/11/1925 The Central Bank for Agriculture (Germany) was organized. Northwest Bancorporation ( The Central Company) was organized 1/24/1929 to aquire controlling interests in banks, trust companies, and various financial institutions. In September 1930 "bandits" robbed the Lincoln National Bank and Trust Company in Nebraska of $2,800,000; the Lincoln National Bank and Trust went into liquidation as a consequence and deposits were taken over by Continental National Bank formerly The German American State Bank, which weathered the Depression like a rock. 10/18/1930 Grand opening of new Trust Department of Continental National Bank, Lincoln. 11/06/1931 Calumet City Bank, IN was closed. Calume City was a center of railroad car manufacturing. 12/28/1932 Articles of Incorporation of The Kryder Company, Inc., "a fifty year corporation." 1933 Banking Act of 1933 established FDIC as a temporary corporation. 6/13/1933 Home Owner's Loan Act approved. 07/15/1933 Farmer's Trust Company, John Burns, Zina Burns, William A. Burns, Mary Burns, Clarence F. Kryder, George Hodson (Later STAR BANK), Lyda M. Hodson, Judge C. Kirkpatrick, Martha M. Kirkpatrick, and Minnie V. Kryder Quit-Claim Lot (20) in the Amended Plat of S.C. Evans Addition to the City of Fort Wayne to THE FORT WAYNE INVESTMENT COMPANY. 1934 National Housing Act of 1934 created the Federal Savings and Loan Insurance Corporation (FSLIC). 1/01/1934 Federal Deposit Insurance commenced. 1935 Banking Act of 1935 made FDIC a permanent independent corporation. Federal Credit Union Act of 1935 created Federal Credit Unions. 1938 77 FDIC insured banks failed. 1947 "The Central Intelligence Agency was created in 1947 with the signing of the National Security Act by President Truman." 03/01/1949 N.Y., Chicago & St. Louis Railway (Nickel Plate Development Corp a subsidiary) bonded debt of March 1, 1934 due. 9/22/1950 Pres. Truman increased FDIC depositor's coverage from $5,000 to $10,000. 1954 7/19/1954 Farmer's and Merchants Bank, the only bank in Valley Center, Kansas was closed by the state examiners. The institution was not a member of the FDIC. 1955 Date of Deposit Insurance German American Bank, Jasper, founded 1910. 9/22/1956 Sen. J. William Fulbright allged that former Illinois State Auditor Orville E. Hodge misused the FDIC for his own purposes. 05/15/1963 The residence of Minnie V. Kryder, Pt Lots 5-6- and 7 of Romy's Subdivision,was sold to Thornbury, mortgaged to Colonial Mortgage Company eventually assigned to Rockford National Bank, Frank A. Higgins, attorney. 05/18/1963 Bordner filed Resolution empowering himself to encumber all property of The Kryder Company, Inc.
EWING REALTY INC : 194383-064 Creation : 07/18/1963 Inactive : 12/31/1987 An Incorporator was George P. Mallers of Beers (Allen County Attorney), Mallers, Backs, (Maxfield) and Salin, 1100 Fort Wayne Bank Building- after the new building was built. 11/22/1963 President Kennedy assassinated . 11/22/1963 National City Lines. Inc., a holding company, acquired 75% of the outstanding stock of Fort Wayne Leasing, Inc., for $200,000 at closing and an additional $150,000 to be paid over the next five years contingent on Fort Wayne's earnings. 1965 Ewing began at International Truck & Engine; Imperial Wizard announced in Atlanta the Klan was planning to infiltrate large industrial and auto enterprises, to gain respectability and lucrative benefits. 1966 Estate of Frank Kryder; Estate of Walt Disney; Frank Freimann (Magnavox) Will; Last profitable year of The Reading Railroad. 1967 Last Annual Reports filed in Indiana by Moorhead & Bordner for The Kryder Company, Inc.
Last Annual Reports filed for The Standard Building Company, Inc.
Last Annual Reports filed for Hoopingarner Construction, Inc.
Last Annual Reports filed for Franklin Security Corporation, Inc.
1969 Fort Wayne National Corporation, Inc.
1970 01/01/1970 Dissolution of the Kryder Company, Inc., along with thousands of Indiana corporations. In mid 1970 The Penn Central Railroad went into bankruptcy court. Hundreds of millions of federal aid was granted. Officials of the railroad blamed its financial crisis on the previous year's coal strike. Foreign Profit BUNGE NORTH AMERICA (EAST), INC. 11720 BORMAN DR SAINT LOUIS MO 63146 US Number 825182 FEI Number 350221100 Filed 10/12/1970 State IN WITHDRAWAL 05/25/2004 NAME CHANGE 08/04/2003 OLD NAME WAS : CENTRAL SOYA COMPANY, INC.
1971 Kryder Homestead in Leo eventually altered for a reservoir, remainder supports Slentz Grainary. 3/11/1971 Financial intrigue involving laywers (Rosenbaum), railroad equipment repair companies, German Banks, transfers form Berlin to Frankfurt, a trust (First Financial) in Liechtenstein (Goetz) , a failed airline (Executive Jet) and the Penn Central CFO (Bevans) surfaced. Only a fraction of lost funds were recovered. 1971  Aetna Life and Casualty Foundation, a vehicle for corporate giving formed. 10/18/1973 U.S. National Bank, San Diego became largest bank failure to date in the United States. 1974 To date, since 1933, FDIC net losses were approximately $75 million. NBD BROKERAGE SERVICES, INC: ONE INDIANA SQUARE , INDIANAPOLIS, IN 46266 : Merged Creation : 4/22/1974 Inactive : 4/1/1996 Other Names 4/3/1989 INDIANA NATIONAL BROKERAGE SERVICES INC6/11/1993 INB BROKERAGE SERVICES, INC.
10/08/1974 Franklin National Bank of Long Island, NY became largest bank failure in U.S. history, was taken over, with FDIC asistance, by European-American Banks and Trust. 1978 The Bankruptcy of Penn Central Railroad was up to that time the nation's largest. Former lines taken over by Conrail and Amtrak. 10/24/1978 Penn Central Corporation formed. 1980 Ronald Reagan elected President. 11/30/1985 Advent of Star Financial Bank announced. 1987 "Founding" of The Carlyle Group; 184 FDIC insured institutions failed and 19 received federal assistance. 9/09/1987 FDIC announced its $1billion bail out package for First City Bank Corp. of Texas which had lost heavily in real estate investments and oil loans. 1988 223 FSLICinsured savings and loan associations failed FDIC recorded a loss for the first time. 200 FDIC insured banks failed and 21 other required assistance. Total assets: $35,700,000,000. Notorious Firstmark Corp. bankruptcy case; FDIC Chairman L. William Seidman announced that by the end of 1988 as many as 250 U.S. banks would fail or need federal assistance. UNION PACIFIC MOTOR FREIGHT COMPANY: Entity : 210 N. 13th St. Rm 1012, ST. LOUIS, MO 63103 : 1988092088 Creation : 9/22/1988 Inactive : 8/21/2000 Original Creation : 8/26/1988 Original Creation State: DE Other Names 2/12/1991 MISSOURI PACIFIC TRUCK LINES, INC.
12/1988 Failure of Silverado Banking Savings and Loan, Neil Bush director. 4/14/1989 Senate Banking Committee endorsed Pres. Bush's taxpayers replenish the FDIC with a $90 billion dollar bail out plan, whole package to cost $157 billion over the next decade. Around 9/28/1990 "Regulators" voted a 60% increase for FDIC premiums effective in 1991, requiring banks to pay 19.5 cents per $100.00 insured. 10/15/1990 Norwest Corporation, Minneapolis, applied to the Federal Reserve Board to acquired American Land Title Co., Inc., Omaha, Nebraska and the request was granted. 11/02/1990 Expiration of North American Properties, Inc., "a forty-year corporation"
1991 George H. W. Bush, President. 3/28/1991 Pres. Bush proposed taxpayers replenish the FDIC with a $90 billion dollar bail out plan. 5/10/1991 Failed May 10 43 MADISON NATIONAL BANK, WASHINGTON, D.C. Total assets $530.8 million. Deposits of $373.7 million in 46,000 accounts assumed by Signet Bank, N.A., Washington, D.C. FDIC outlay $367.4 million. Failed 44 MADISON NATIONAL BANK OF VIRGINIA, MCLEAN, VIRGINIA. Total assets $176.0 million. Deposits of $154.5 million in 18,100 accounts assumed by Signet Bank-Virginia, Richmond, Virginia. FDIC outlay $113.5 million. Failed 45 (t)THE WASHINGTON BANK OF MARYLAND, BALTIMORE, MARYLAND. Total assets $38.0 million. Insured deposits of $35.0 million in 2,100 accounts transferred to The First National Bank of Maryland, Baltimore, Maryland. FDIC outlay $30.8 million. 5/19/1991 Failed 46 FIRST NATIONAL BANK OF CEDAR HILL, CEDAR, HILL, TEXAS. Total assets $11.6 million. Deposits of $11.8 million in 2,600 accounts assumed by First State Bank, Blooming Grove, Texas. FDIC outlay $1.610million. (PR-76-91). 47 Failed CAPITAL BANK, DALLAS, TEXAS. Total assets $118.3 million. Deposits of $112.3 million in 11,200 accounts assumed by Bank One, Texas, N.A., Dallas, Texas. FDIC outlay $15.978 million. (PR-77-91). 10/18/1991 Failed 104 CENTRAL BANK, MERIDEN, CONNECTICUT. Total assets $675.2 million. Deposits of $626.5 million in 66,800 accounts assumed by CenterBank, Waterbury, Connecticut. FDIC outlay $ 373.6 million. (PR-152-91). 105 CONNECTICUT VALLEY BANK, CROMWELL, CONNECTICUT. Total assets $28.8 million. Deposits of $27.9 million in 2,100 accounts assumed by Mid Conn Bank, Kensington, Connecticut. FDIC outlay $23.6 million. (PR-153-91). Failed 106 (t)MISSION VALLEY BANK, NATIONAL ASSOCIATION, SAN CLEMENTE, CALIFORNIA. Total assets $42.7 million. Total deposits $40.9 million in 2,300 accounts. Insured deposits transferred to Mid City Bank, National Association, Los Angeles, California. FDIC outlay $30.3 million. (PR- 154-91) 7/15/1957 A.O.I. Mission Valley May Corp., California; 9/12/1963 Merger of West Valley May Corporation(California) and May Mission Valley (California) Kaufmann-May (Pennsylvania) into May Stores Shopping Centers, Inc.(Missouri). Failed 108 COOLIDGE BANK AND TRUST COMPANY, BOSTON, MASSACHUSETTS. Total assets $264.6 million. Deposits of $260.5 million in 29,500 accounts assumed by Pioneer Financial, A Cooperative Bank, Boston, Massachusetts. FDIC outlay $242.2 million. Failed 09 (w)THE CITIZENS BANK OF PAGOSA SPRINGS, PAGOSA SPRINGS, COLORADO. Total assets $18.0 million. Deposits of $17.0 million in 2,600 accounts assumed by Citizens Bank of Pagosa Springs, Pagosa Springs, Colorado. FDIC outlay $1.0 million. Failed 110 FIRST HANOVER BANK, WILMINGTON, NORTH CAROLINA. Total assets $47.6 million. Deposits of $35.5 million in 5,200 accounts assumed by Central Carolina Bank and Trust Company, Durham, North Carolina. FDIC outlay $8.2 million. 1993 Expiration of Trust F.S. 58070 (Fairfield Terrace) 11/12/1993; Barnett Banks, Inc. in March 1993 acquired First Florida Banks, Inc., the last of Barnett's major acquisitions. This gave Barnett Banks, Inc. a total of 638 offices, assets of $39 billion, and 27% of Florida's deposits. Barnett Banks, Inc. was the largest banking organization in Florida and the 18th largest in the United States. January 22 1 (i)COLUMBIA NATIONAL BANK, SANTA MONICA, CALIFORNIA. Total assets $47.8 million. Total deposits $47.7 million in 1,500 accounts. Insured deposits assumed by Western Bank, Los Angeles, California. Advance dividend 61 percent of uninsured claims. FDIC outlay $39.8 million (PR-4-93). January 29 2 (b)Failed FIRST NATIONAL BANK OF VERMONT, BRADFORD, VERMONT. Total assets $293.5 million. Total deposits $263.2 million in 36,800 accounts. Insured deposits assumed by New First National Bank of Vermont, Bradford, Vermont, a newly-chartered FDIC bridge bank. Advance dividend 50 percent of uninsured claims (PR 8-93). FDIC Board approved sale of bridge bank to The Merchants Bank, Burlington, Vermont, on May 18, 1993 (PR-55-93). 2/25/1993 February 25 4 (i)Failed THE PLANTERS NATIONAL BANK OF ROSEBUD, ROSEBUD, TEXAS. Total assets $13.1 million. Total deposits $12.0 million in 2,200 accounts. Insured deposits assumed by First National Bank in Cameron, Cameron, Texas. Advance dividend 78 percent of the uninsured claims. FDIC outlay $5.8 million (PR-12-93). 2/26/1993 February 26 5 (i)Failed JEFFERSON NATIONAL BANK, WATERTOWN, NEW YORK. Total assets $226.5 million. Total deposits $219.0 million in 32,500 accounts. Insured deposits assumed by Fleet Bank of New York, Albany, New York. FDIC outlay $160.7 million (PR-14-93). 3/04/1993 March 4 6 (i) Failed FIRST AMERICAN CAPITAL BANK, N.A., LAGUNA BEACH, CALIFORNIA. Total assets $30.1 million. Total deposits $26.3 million in 2,100 accounts. Insured deposits assumed by Orange National Bank, Orange, California. FDIC outlay $16.8 million (PR-17-93). 11 (i)A failed California Bank OLYMPIC NATIONAL BANK, LOS ANGELES, CALIFORNIA. Total assets $83.3 million. Total deposits $81.8 million in 5,200 accounts. Insured deposits assumed by Western Bank, Los Angeles, California. Advance dividend 63 percent of uninsured claims. FDIC outlay $52.2 million (PR-30-93). A.O.I. Indiana CAPITOL MORTGAGE BANKERS, INC. : TEMPLE-INLAND MORTGAGE CORPORATION : 301 Congress Ave. , AUSTIN, TX 78701 : 1992071079 Status: Merged Creation : 7/24/1992 Inactive : 4/2/1993 Original Creation : 7/27/76 Original Creation State: TX Other Names 11/9/1992 CAPITOL MORTGAGE BANKERS, INC.
4/15/1993 A failed California Bank April 15 13 (i)FIRST WESTERN BANK, N.A., SAN DIEGO, CALIFORNIA. Total assets $14.2 million. Total deposits $13.4 million in 1,400 accounts. Insured deposits assumed by Peninsula Bank of San Diego, San Diego, California. Advance dividend 65 percent of uninsured claims. FDIC outlay $12.1 million (PR-34-93). 4/30/1993 Failed AMERICAN COMMERCE NATIONAL BANK, ANAHEIM, CALIFORNIA. Total assets $139.0 million. Total deposits $120.8 million. Insured deposits transferred to Southern California Bank, Downey, California. 5/21/1993 Failed NEW ENGLAND SAVINGS BANK, NEW LONDON, CONNECTICUT. Total assets $915 million. Total deposits $700 million in 92,000 accounts. Insured deposits assumed by Citizens Savings Bank, Providence, Rhode Island. Advance dividend 75 percent of uninsured claims. 6/25/1993 June 25 23 Failed CITY NATIONAL BANK, WASHINGTON, D.C. Total assets $24.5 million. Deposits of $22.2 million in 1,050 accounts assumed by Crestar Bank, N.A., Washington, D.C. FDIC outlay $15.2 million (PR-75-93). 7/29/1993 July 29 31 Failed THE WOLFE CITY NATIONAL BANK IN WOLFE CITY, WOLFE CITY, TEXAS. Total assets $35.5 million. Total deposits $36.4 million in 5,000 accounts. Insured deposits assumed by Sulphur Springs State Bank, Sulphur Springs, Texas. FDIC outlay $2.1 million (PR-90-93). 8/27/1993 August 27 34 (i)Failed MARITIME BANK OF CALIFORNIA, LOS ANGELES, CALIFORNIA. Total assets $32.4 million. Total deposits $30.5 million in 1,200 accounts. Insured deposits assumed by Western Bank, Los Angeles, California; and Bay Cities National Bank, Redondo Beach, Califoria. Advance dividend 58 percent of uninsured claims. FDIC outlay $14.0 million (PR-105-93). 10/14/1993 October 14 38 (w)Failed PLAZA BANK, NATIONAL ASSOCIATION OF NEW BRAUNFELS, NEW BRAUNFELS, TEXAS. Total assets $61 million. Total deposits $57.7 million in 6,600 accounts. Insured deposits assumed by Texas Commerce Bank -- New Braunfels, National Association, New Graunfels, Texas. Advance dividend 70 percent of uninsured claims (PR-119-93). 10/15/1993 October 15 39 (p)Failed BRENTWOOD (Brentwood Tennesee=North American Van Lines)THRIFT AND LOAN ASSOCIATION, LOS ANGELES, CALIFORNIA. Total assets $11.7 million. Total deposits $9.8 million in 200 accounts. Insured deposits paid out. Advance dividend 58 percent of uninsured claims. FDIC outlay $9.7 million (PR-120-93). 10/21/1993 October 21 40Failed MID CITY BANK, NATIONAL ASSOCIATION, BREA, CALIFORNIA. Total assets $105 million. Deposits of $96.4 million in 2,400 accounts assumed by Chino Valley Bank, Ontario, California. FDIC outlay $60.1 million (PR-123-93). 10/29/1993 October 29 41 (i)Failed BANK OF SAN DIEGO, SAN DIEGO, CALIFORNIA. Total assets $316.8 million. Total deposits $298.4 million in 19,000 accounts. Insured deposits assumed by Grossmont Bank, La Mesa, California, and Harbor Bank, Long Beach, California. Insured money desk deposits paid out. Advance dividend 50 percent of uninsured claims. FDIC outlay $229.7 million (PR-125-93). 7/08/1994 A failed California Bank July 8 PIONEER BANK, FULLERTON, CALIFORNIA. Total assets $136.8 million. Total deposits $128.5 million in 4,300 accounts. Insured deposits assumed by Chino Valley Bank, Ontario, California. Insured money desk deposits paid out. Advance dividend 50 percent of uninsured claims (PR-42-94). 7/15/1994 A failed California Bank July 15 BANK OF SAN PEDRO, SAN PEDRO, CALIFORNIA. Total assets $123.4 million. Total deposits $115.8 million in 10,300 accounts. Insured deposits assumed by Home Bank, Signal Hill, California. Insured money desk deposits paid out. Advance dividend 50 percent of uninsured claims (PR-43-94). 7/29/1994 A failed California Bank COMMERCEBANK, NEWPORT BEACH, CALIFORNIA. Total assets $156.5 million. Total deposits $140.0 million in 4,600 accounts. Insured deposits assumed by California State Bank, West Covina, California. Insured money desk deposits paid out. Advance dividend of 67 percent of uninsured claims (PR-47-94). 7/29/1994 A failed California Bank WESTERN COMMUNITY BANK, CORONA, CALIFORNIA. Total assests $60.6 million. Total deposits $54.8 million in 5,500 accounts. Insured deposits assumed by Bank of San Bernardino, San Bernardino, California. Insured money desk deposits paid out. Advance dividend of 50 percent of uninsured claims (PR-48-94). 8/12/1994 August 12 Failed BANK OF NEWPORT, NEWPORT BEACH, CALIFORNIA. Total assets $174.3 million. Total deposits $159.5 million in 19,000 accounts. Insured deposits assumed by Union Bank of San Francisco, California. Advance dividend of 50 percent of uninsured claims (PR-53-94). 8/26/1994 August 26Failed CAPITAL BANK, DOWNEY, CALIFORNIA. Total assets $81.4 million. Total deposits $76.7 million 12,700 accounts. Insured deposits assumed by Landmark Bank, La Habra, California, and Commerce National Bank, City of Commerce, California. Advance dividend 70 percent of uninsured claims (PR-57-94). 1995 1/20/1995 January 20 Failed GUARDIAN BANK, LOS ANGELES, CALIFORNIA. Total assets $352.8 million. Total deposits $262.7 million in 4,700 accounts. Insured deposits assumed by Imperial Bank, Los Angeles, California. Advanced dividend 50 percent of uninsured claims (PR-3-95, PR-4-95). Name Change UNION FINANCIAL CORP. : ATTN: Jane-Kerns- Corporate Accounting 7500 W. Jefferson Blvd., FT WAYNE, IN 46804 : 1988050844 Creation : 5/17/1988 Inactive : 12/31/1996 Other Names 1/20/1995 UNION SECURITIES CORP.
3/31/1995 Failed LOS ANGELES THRIFT AND LOAN, LOS ANGELES, CALIFORNIA. Total assets $24.9 million. Total deposits $22.3 in 451 accounts. Insured deposits assumed by California Federal Bank, FSB, Los Angeles, California. Advance dividend 50 percent of uninsured claims . 10/16/1933 United Mutual Life Insurance Company, Inc. redomiciled in Indiana. 3/11/1996 March 11 A failed Pennsylvania Bank METROBANK OF PHILADELPHIA N.A., PENNSYLVANIA. Total assets $43.3 million. Total deposits $39.9 million in 1,800 accounts. Insured deposits assumed by Jefferson Bank, Haverford, Pennsylvania. Advanced dividend of 58 percent of the approximately $1.7 million in uninsured claims. 6/14/1996 A failed Texas Bank June 14 THE FIRST NATIONAL BANK OF THE PANHANDLE, PANHANDLE, TEXAS. Total assets of $78.7 million and total deposits of $76.1 million. Sun Bank, Sunray, Texas, will assume $40 million in 4,900 accounts and The Plains National Bank of West Texas, Lubbock, Texas, will assume $36.1 million in 2,500 accounts. $752,000 in 102 accounts exceeded the federal insurance limit and was not assumed by either bank. No advanced dividend was provided. 08/09/1996 A failed California Bank August 9 [SAIF] UNION FEDERAL SAVINGS BANK, FSB, LOS ANGELES, CALIFORNIA. Total assets of $34.3 million. Deposits of $30.6 million in 1,000 accounts assumed by Dean Witter Trust FSB, Jersey City ,New Jersey. About $2.1 million in 72 accounts exceeded the insurance limit. No advanced dividend was provided. CENTRAL MONEY MORTGAGE CO. (IMC), INC.: 8840 Stanford Blvd Ste 2200, COLUMBIA, MD 21045: 7/23/1997 Inactive : 10/1/1999 Original Creation Date: 7/9/1997 Original Creation State: FL Other Names 11/6/1997 CMMC HOLDINGS, INC.
4/09/1998 April 9 (BIF) Failed Omnibank, River Rouge, Michigan, with total deposits of $39.9 million and total assets of $42.2 million. All deposits and $41.8 million in assets assumed by the newly chartered ShoreBank, Detroit, Detroit, Michigan (PR-24-98). 8/07/1998 August 7 (BIF) Failed Q Bank, Fort Benton, Montana, with total deposits of $13.6 million and total assets of $15.1 million. The insured deposits of $12.3 million and $2.5 million in assets assumed by the newly chartered Heritage State Bank, Fort Benton (PR-54-98). 12/10/1999 December 10 (BIF) Failed Golden City Commercial Bank, New York, New York, with total deposits of $82.0 million and total assets of $89.3 million. All deposits and $85.4 million in assets assumed by Cathay Bank, Los Angeles, California (PR-79-99). FIRST NATIONAL CITY CORPORATION: 8140 Bounty Ct. , INDPLS, IN 46236 : 1999091975 Creation : 9/29/99 : This entity owes Business Entity Report(s). Other Names : 10/1/1999 COVENANT FINANCIAL GROUP, INC. 12/10/1999 COVENANT CAPITAL RESOURCES INC.
4/10/2000- 50 years after last new stock issued before "The Kryder Company, Inc." disappeared, Frank H. Kryder, Trustee for Waynedale and other realty including Lot 209 Avondale Addition. 11/01/1950 General Mortgage of Atlas Pipeline Corp due, interest paid to The Pennsylvania Company for Insurances on Lives and Granting Annuities; first mortgage was issued in 1935. 8/30/2001 Swiss Re acquisition of Lincoln Re announced, restated on 9/07/2001. 9/07/2001 A failed Arkansas Bank On September 7, 2001, Sinclair National Bank, Gravette, Arkansas... accounts to Delta Trust & Bank, Parkdale, Arkansas All payments should be mailed to the Bella Vista office at1790 Forest Hills Blvd., Bella Vista, AR 72715. Swiss Re acquisition of Lincoln Re announced, restated on 9/07/2001. 9/10/2001 LNC sold Lincoln Reinsurance to Swiss Re (aka North American Re) the day before the WTC attack; FTC Transaction Number: 20012356 Early Termination : 09/10/2001 Acquiring Person: Swiss Reinsurance Company Acquired Person: Lincoln National Corporation Acquired Entity: The Lincoln National Life Insurance Company (The purchase contract provided that the claim costs from the 11 September 2001 events remain with the seller). 11/15/2001 Reuter's (WTC) Release- :Swiss Re, which has already paid its share of an initial $75 million payment to the insurance : holders, said that if the full value of the $3.5 billion policy were paid out now, $1.5 billion would : go to the Port Authority, $663 to General Motors Acceptance Corp. (GMAC aka Colonial)and UBS Warburg, : which lent Silverstein money to take on the lease, and a maximum if $1.3 billion to Silverstein : and Westfield Holdings Ltd. his partners in the lease. " 11/12/2002 Pres. G. W. Bush told the United Nations: "Iraq likely maintains stockpiles of VX, mustard and other chemical agents and has made several attempts to buy high-strength aluminum tubes used to enrich uranium for a nuclear weapon." 12/17/2002 Conseco, Inc., a Carmel Indiana investment, insurance, lending company, filed Chapter 11 bankruptcy.